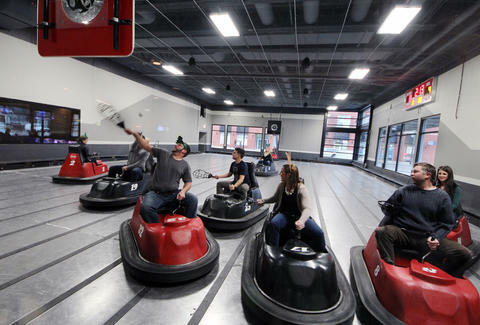 For the uninitiated, Whirlyball isn’t a difficult concept to grasp: it's just lacrosse... plus basketball... plus, uh, a bumper car arena. For the already-very-initiated, Whirlyball is also super fun. 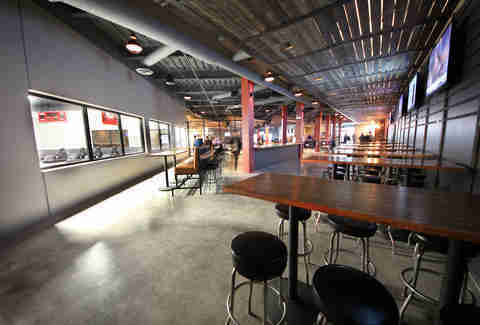 Either way, you’re not going to need much convincing (though we’re doing it anyway) to visit the gigantic new Whirly complex in Bucktown, complete with a 32-strong beer list, Buffalo chicken BLTs, bowling, LASER TAG, and 60 flat screens. Having moved south a block from its former Fullerton and Elston address, the newly constructed facility is nearly twice the size of the old one (at 50,000sqft). 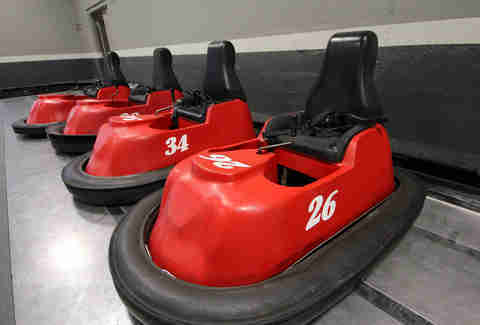 Inside are three Whirlyball courts, where the cars work similarly to bumper cars, except you can go in reverse, too, so you don't get trapped in any corners. 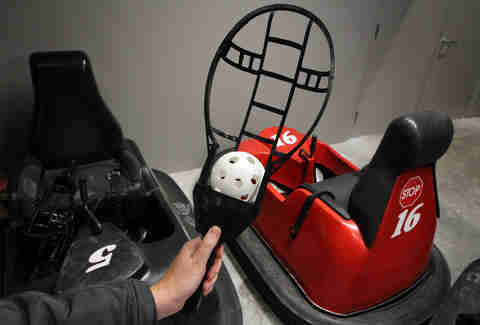 You'll be wielding the mighty scoop to corral Wiffle balls and flick shots at a basketball-like backboard equipped with touch sensors. Slashing another player is a two-point penalty, unless you convince the refs that you're playing "street rules", which, duh, why wouldn't you be? The courts can be reserved for parties, plus there are also league nights and open courts for walk-ins, should you want to jump in a pick-up game. 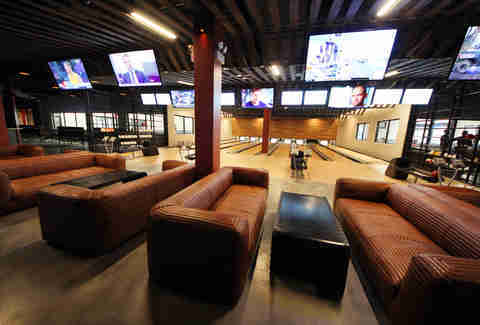 Seating is more than ample, with giant leather sofas, tables made out of repurposed wood from bowling lanes, and 60 (60!!) flat screen TVs. 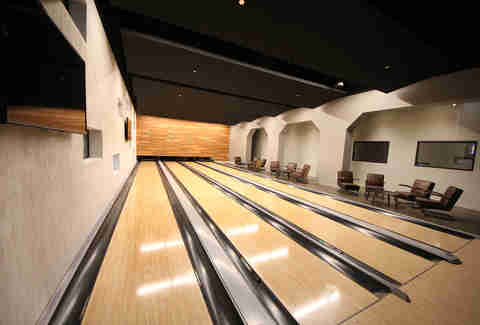 There are eight bowling lanes on the main floor, but the true Lebowskis of the world will spring for the private upstairs bowling lounge. 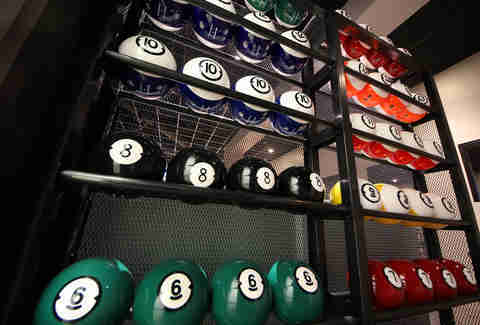 The bowling balls have a billiard motif, with the ball number corresponding to its weight. 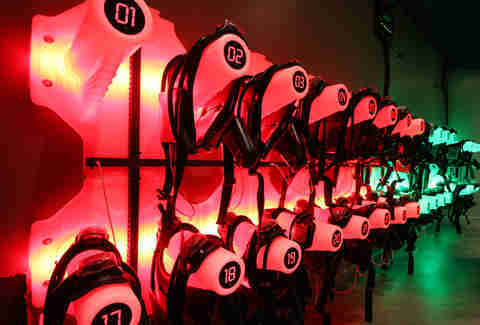 You can also relive your teenage anxieties or unleash your inner-Barney Stinson in the laser tag arena (WUT? ), or book the second floor's 300-person event space with a small porch, should you ever want to throw a Whirlyball wedding. 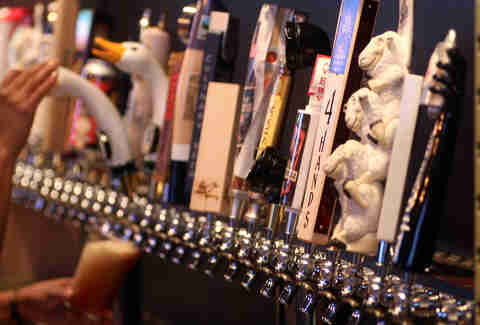 The Whirlybar has 32 beers on tap, complete with rotating local craft brews and a cocktail menu. 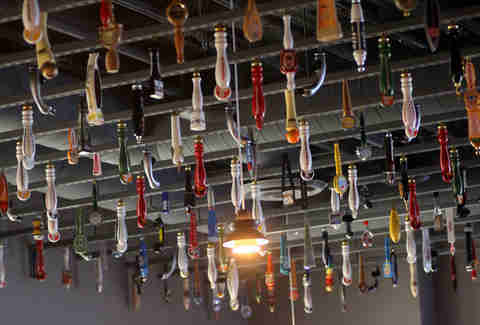 Coolest part though: when the tap handles retire from beer-pouring, they're screwed onto the ceiling. 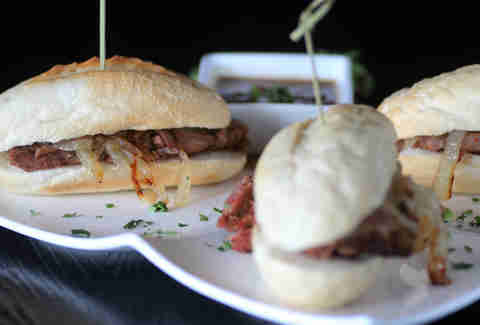 Pub fare on the menu is slider-ful, with options like New York pot roast sliders topped with caramelized onions and horseradish sauce, with gravy for dipping. 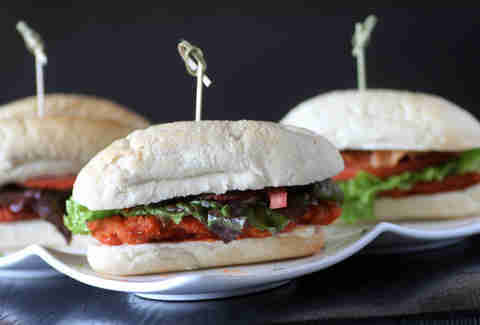 Other mini sandwich options include Buffalo chicken BLTs, shrimp quesadillas, and artichoke capreses. An absolute must, though? 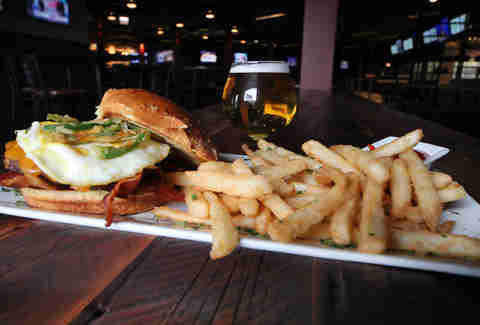 The Western Ave Burger, topped with bacon, egg, fried jalapeño straws, and red pepper jelly. 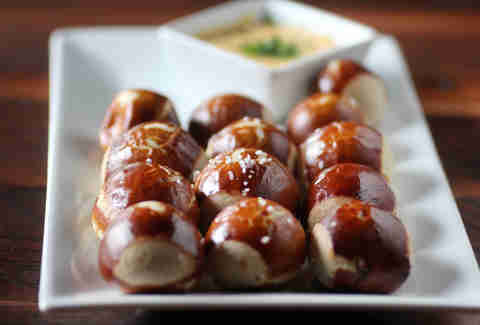 Reigning champ among the apps: baked pretzel bites with Goose Island beer cheese. Sean Cooley is Thrillist's Chicago Editor and he definitely wasn't be the guy who's Whirlyball car was stuck in the corner. Definitely. Follow him @SeanCooley.